Tang Jitian, Liu Wei, Zheng Enchong, and Tang Jingling have all had their lawyer licenses revoked. Wang Cheng, Jiang Tianyong, and Teng Biao have all had their licenses canceled. None of these individuals is a lawyer, and none of their activities have anything to do with the legal profession. We respectfully request that lawyers and the general public take note. 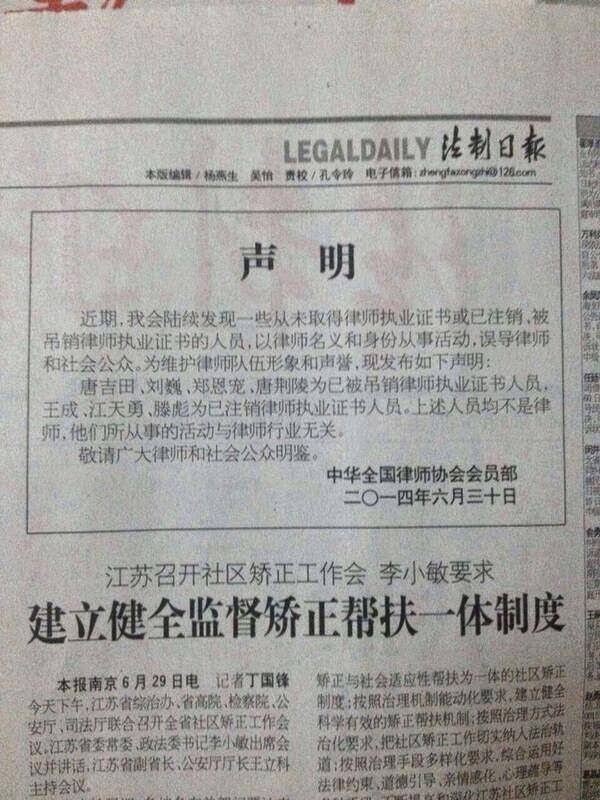 Stern Statement: In light of the ACLA statement published yesterday in Legal Daily, which stated “Wang Cheng . . . [has] had [his] license to practice canceled,” I hereby make the following stern statement: 1. To date, the Zhejiang Province Department of Judicial Administration has never informed me that my license to practice has been canceled; 2. In the coming days, I will pursue legal measures to hold the ACLA, Legal Daily, and the Zhejiang Department of Judicial Administration responsible. 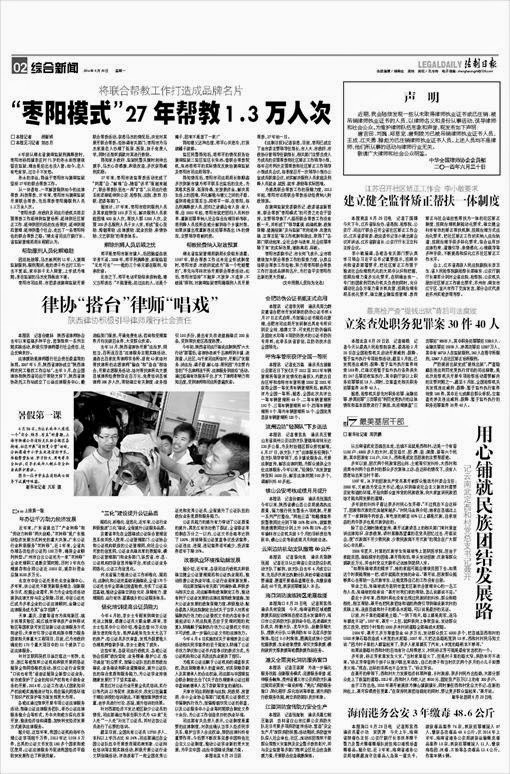 On 30 June 2014, the membership division of the ACLA published a statement in the Legal Daily (the organ of the Central Politico-Legal Commission), stating: Tang Jitian et al. have all had their lawyer licenses revoked, none of their activities have anything to do with the legal profession, we respectfully request that lawyers and the public take note. After working as a lawyer, I earned the wrath of powerful departments for handling human rights cases involving dissent and belief and for promoting the professional autonomy of lawyers (by proposing direct elections of the Beijing Lawyers Association). In May 2010, my license to practice was revoked on groundless charges by the Beijing Municipality Bureau of Judicial Administration. On 9 September of that year, I filed suit with the Xicheng District Court in Beijing, but after receiving my documents the court refused to accept the case and never issued any written decision. I have been deprived of my litigation rights ever since. After my license to practice was illegally revoked, I continued to participate in human rights cases as an ordinary citizen and provide the best legal assistance to others I could possibly provide. I have never deliberately concealed the fact that I did not have a license to practice. The primary responsibility of the ACLA should be to protect the rights and interests of lawyers, but consciously or not it acts as a foot soldier for powerful departments to retaliate and persecute lawyers. In today’s world, no one can hold back the tide of economic liberalization and political democratization. If those senior leaders in the ACLA cannot return to their original positions as lawyers and continue to act as thugs, they will inevitably be nailed to history’s pillar of shame! No amount of noise can make me drop my human rights work. I welcome generous instruction from lawyers and other individuals.